Who doesn't love truffles? 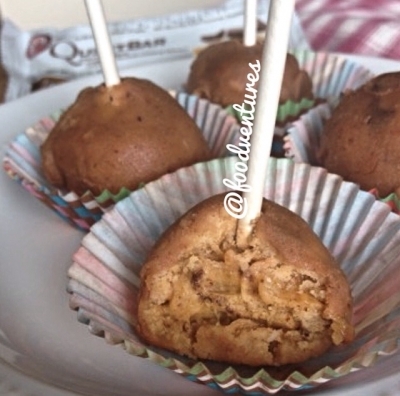 These peanut butter truffles are stuffed with a quest cookie dough bar then rolled in a quest cookie dough glaze. they are not only super easy to make but made with minimal ingredients and, of course, super delicious! Microwave quest bar until soft then divide into 5-6 pieces. Roll each piece into a small ball and set aside. In a small bowl, combine the rest of the Ingredients and mix well until easily manageable. Pinch off pieces of your mixture and flatten into a small circle. Place one of the quest pieces in the center then wrap you truffle mixture around it until completely covered. Repeat with rest of truffle mixture. To make the coating, break 1 cookie dough quest bar into pieces and mix with 1/8 cup almond milk. Heat on medium heat and continually stir until bar fully melts. Drop truffles into mixture and fully coat. Set aside on a plate and set in fridge until fully "set". Coating makes enough for 2 batches of truffles.